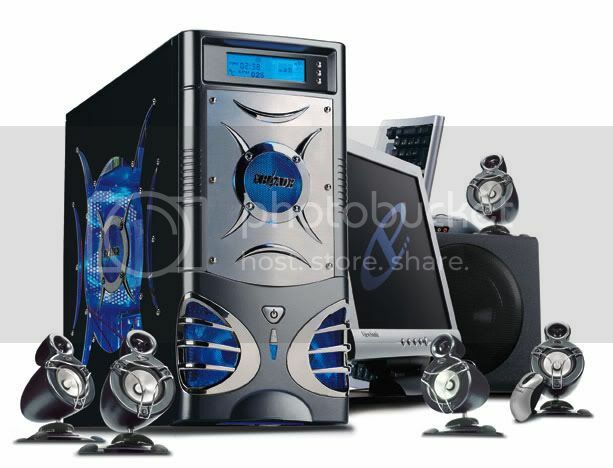 Best solutions for your PC needs. Prompt, Reliable Service. Happy New Year! Out with the old, in with the new: may you be happy the whole year through. We hope to help start your year a little easier by providing a checklist to make sure your computer is up to date and running strong to support you throughout the year. How to tell if your computer is outdated? If it is over 6 years old, it is not strong enough to install the latest operating system, or if it is slowing down on you. Computers typically last 6 to 10 years because computer hardware advances so quickly these days, it has to keep up with the demanding software (operating system) that it is running. The hardware also begins to slow down due to old age, and some parts will eventually stop running. Hardware will also begin to loose connection to older computers, and will not be compatible with it. Computers are similar to cars, you do not want to put too much money into an old car to replace parts when you can use that money to purchase a more reliable one. Minor tune-ups and updates are necessary when you have a computer, but the older they get, they begin to have major problems and that is when you should start thinking about replacing the computer. Do not spend more time fixing it rather than using it. Step two: Keep your computer happy, and maintain its performance throughout the year. We use and rely on our computers more than ever before. It is important to keep them updated. Run your anti-malware programs and scan them once a week. There are thousands of viruses and scams on the internet, be aware, and protect your computer with your anti-virus and anti-malware program. You should also empty the recycle bin. Many people throw things in the trash which still takes up space on the computer so it is always good to empty the recycle bin once a week as well. Step three: Make sure you are backing up your files! Computers can and will crash at any time, to prevent yourself from loosing files, implement a backup system. There are many options, you can try a cloud backup…ABM uses “crashplan” or you can simply use an external hard drive/flash drive and setup automatic backup within the windows or mac operating system. Additional tips to starting your new year the right way! Make sure all hardware is plugged into a surge protector to prevent hardware failure if a power outage occurs. Clean dust from inside and outside of your computers, printers, monitors, and other peripherals. Purchase ink for your printers. Keep a record of software license keys just in case the software has to be reinstalled in the future. Most users assume that they need an anti-virus program to automatically run without having to do anything else to secure the computer. Unfortunately, it is not that easy, hackers are becoming smarter, and finding many different ways into your personal information, and computer. An anti-virus program is the first step, but you also need more layered security to protect your computer and information as well. We will talk about the layered security that you should have. An anti-virus program is important but an automatic setup for the program is not always the best setup for your anti-virus. Many virus programs can crash, and will not notify the user if they are not working properly. If the program is not checked often, and the program crashed, the computer will not be able to block virus and spyware from entering the computer. It is also good to make sure that your virus programs can also block pup-ware, has internet filtering, spyware, and malware. You can also install a separate malware and spyware program such as using the built-in Windows Defender anti-virus program along with Malwarebytes to prevent Malware. Always, always, update your anti-virus programs as well. It is never safe to allow websites to save or remember your password or automatically sign in. If a hacker finds their way onto your computer, they have free access to those websites and your information. It is always safe to set a desktop password. This is the log- in password that you type in as soon as the computer turns on. It prevents thieves from having all access to your computer. Using numbers and symbols with your password is always a good way to make it harder for anyone trying to hack your password. Additional quick tips: use a spam filter on your email, and do not open any emails that you do not know of or where it is coming from. In addition, do not click or open any pop-ups or fake anti-virus programs. Microsoft is Ending Windows Live Mail! Don’t Get Locked Out of Windows! The Kangaroo ransomware is the latest ransomware from the developer behind the Apocalypse Ransomware, Fabiansomware, and Esmeralda. What makes this version stand out a bit more is the use of a legal notice as a ransom note that is displayed to all victims before they login to their computer. This makes it so a victim has to view the ransom note before they are able to login to Windows. Also, due to the ransomware terminating the Explorer processes when started and preventing the launching of Task Manager, it essentially locks a user out of Windows until they pay the ransom or remove the infection. Though the screenlocker can be disabled in Safe Mode or by pressing the ALT+F4 keyboard combination, for many casual computer users this would essentially prevent them from using their computer. Unlike most other ransomware infections, this family is not spread through exploit kits, cracks, compromised sites, or Trojans, but instead by the developer manually hacking into computers using Remote Desktop. When the dev hacks into a computer and executes the ransomware, a screen will be shown that contains the victim’s unique ID and their encryption key. When the developer clicks on Copy and Continue, the information will be copied into the Windows clipboard so that developer can save it. The ransomware will then begin to encrypt the computer’s files and will append the .crypted_file extension to an encrypted file’s name. This ransomware also performs the strange practice of creating an individual ransom note for every file that is encrypted. These ransom notes will be in the format of filename.Instructions_Data_Recovery.txt. When finished Kangaroo will display a lock screen that displays a fake screen implying that there is a critical problem with the computer and that the data was encrypted. It then provides instructions on how to contact the developer at kangarooencryption@mail.ru to restore the data. This ransomware will also configure the HKEY_LOCAL_MACHINE\SOFTWARE\Microsoft\Windows NT\CurrentVersion\Winlogon “LegalNoticeText” registry value so that it shows a legal notice that a user must read before they are shown the Windows login prompt. This guarantees that a victim, or a computer’s administrator, will see the ransom note the next time they login. While at this time, there is no way to decrypt the encrypted files for free, it is possible to remove the screenlocker portion so that victims can use their computer again. For those who need help with this, I provide instructions in the next section. Kangaroo encrypted files cannot be decrypted for free. Unfortunately, files encrypted by the Kangaroo ransomware cannot be decrypted for free. The only way to recover encrypted files is via a backup, or if you are incredibly lucky, through Shadow Volume Copies. Though Kangaroo does attempt to remove Shadow Volume Copies, in rare cases ransomware infections fail to do so for whatever reason. Due to this, if you do not have a viable backup, I always suggest people try as a last resort to restore encrypted files from Shadow Volume Copies as well. Will Dormann, a Vulnerability Analyst for the US-CERT Coordination Center (CERT/CC), is advising Microsoft to continue developing EMET because Windows 10 does not provide the same protection measures, in spite of the company’s claims. EMET, which stands for Enhanced Mitigation Experience Toolkit, was launched in 2009 as a standalone application that users could install separately from Windows and bolster the defenses of their operating systems. Earlier this month, Microsoft announced that it moved the EMET End-of-Life date from January 27, 2017, to July 31, 2018. In its announcement, the company alluded that Windows 10 is as secure as EMET, just because many of EMET’s features had been embedded in the operating system’s core. Dormann disagrees with Microsoft’s statements. The security expert says that Microsoft did not integrate all of EMET’s protection features. He goes on into detail and splits EMET’s protection features into two categories, System-Wide Protection and Application-Specific Protection, and explains that Microsoft only embedded a few of these in Windows 10, mostly at the OS core level. The problem is that despite feature some of the EMET OS-level protection features, EMET is a fantastic security tool because of its multiple application-level defenses. These application-specific EMET mitigations are applied as a runtime-injected library into the processes of other apps. 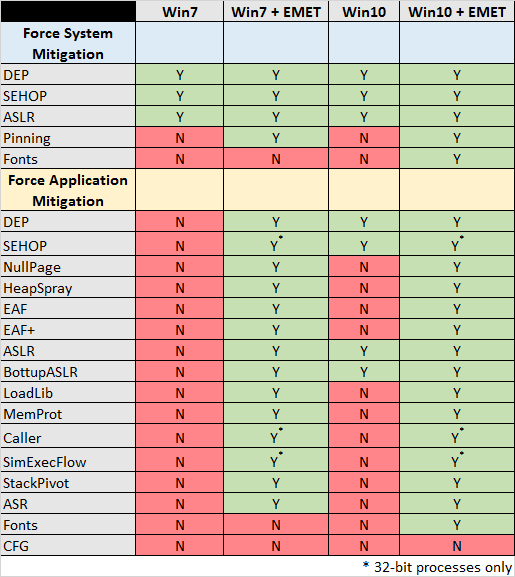 Microsoft has not embedded all of EMET’s application-level defenses into Windows 10, as Dormann highlights via a simple table. Dormann’s table shows that even an older Windows 7 OS with EMET installed is far better protected than an out-of-the-box Windows 10, which Microsoft claims is more secure. He also highlights another problem, and that’s the slow adoption of new technologies in user software. “The problem is that the application needs to be specifically compiled to take advantage of CFG,” which is Control Flow Guard, one of EMET’s security features embedded in Windows 10. EMET’s role was to force these extra security features upon applications that didn’t have them or the developers didn’t bother taking advantage of them. Furthermore, the security experts recommend that companies continue to use and deploy EMET after the cut-off date. Let’s just hope Microsoft decides to open-source the EMET code. There are some people interested in continuing its development. If you lock your computer and walk away, it takes only 30 seconds for a hacker armed with a small $5 Raspberry Pi Zero, which is loaded with devious code, to completely pwn your password-protected computer and install remotely accessible backdoors. PoisonTap, the latest creation of hacker and developer Samy Kamkar, has a long list of wicked slick capabilities, including the fact that after an attacker removes the device from a USB port, a backdoor and remote access will persist on both your computer and your router. When inserted into a USB port, PoisonTap tricks a computer into believing it was just plugged into a new Ethernet connection that takes over all internet traffic. Even if you locked your computer, be that a Mac or PC, but leave an HTTP-based site open in a browser window, then the site continues to run HTTP requests in the background. PoisonTap intercepts all unencrypted web traffic and sends the data to an attacker-controlled server. By capturing non-encrypted authentication cookies, an attacker could access a user’s personal accounts. Security recommendations, for both server administrators and device owners. 2016 is well on its way to becoming the year of ransomware, which should come as no surprise to anyone following the threat landscape. Cyber-extortion’s newest kid on the block is called KeRanger and I think it’s set to change the ransomware game forever, by significantly widening the potential victim base. If you haven’t heard of ransomware, it’s a class of malicious software that’s designed to take your computer, or its data, hostage so that attackers can extort you to get control back. Ransomware variants have double or tripled over the past few years, and many effective new variants have already victimized users this year, including the likes of Locky and Ransom32. Although it has just recently gained steam, this type of attack is probably a lot older than you might think, the first example being the AIDS trojan that came out via floppy disc in the late 80s. Since then, criminals have created many different types of ransomware, from threats that try to prevent your computer from booting, to ones that display fake police messages. However, it wasn’t until late 2013 that cyber criminals really became efficient at making money with ransomware. What changed? Attackers discovered and perfected crypto-ransomware. Crypto-ransomware is a class of ransomware that finds and encrypts important files on a victim’s computer. Today’s crypto-ransomware (e.g. CryptoLocker and CryptoWall) uses strong encryption that’s too tough to crack, it leverages anonymizing networks to protect its command and control servers, and it exploits hard to track payment systems (Bitcoin), making it difficult for authorities to follow the money trail. Why is KeRanger different and relevant? While on the surface, KeRanger seems similar to other crypto-ransomware variants — it encrypts your important files, leaves an extortion message, and asks you to pay one Bitcoin ($400 USD) to get them back — three things make it very unique, and even revolutionary. KeRanger is the first crypto-ransomware that effectively targets Apple OS X computers! Apple users tend to think they’re immune to malware. KeRanger proves that this isn’t the case. While researchers and bad guys have experimented with some OS X ransomware samples, none has spread in the wild or encrypted files as effectively as KeRanger. KeRanger leveraged a very sophisticated supply-chain attack to spread. 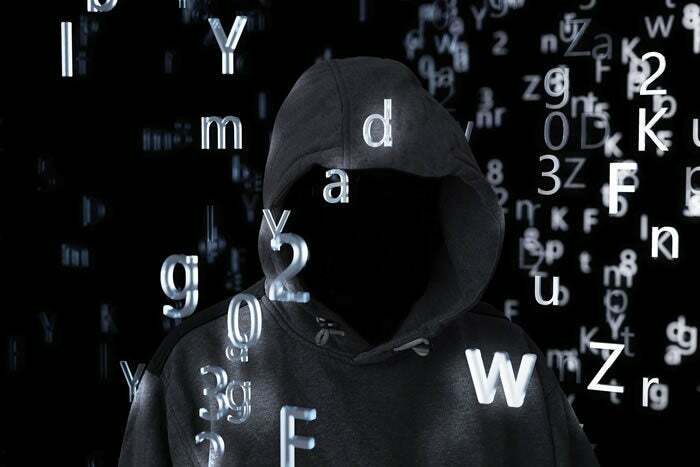 Usually, malware authors spread their ransomware emails with tricky links or attachments, through network or software vulnerabilities, or distributed from their botnets. However, in this case, the attackers actually hijacked the website of a legitimate OS X torrent client called Transmission. They created a “trojaned” version of the installer and even signed it with a legitimate developer digital certificate that OS X’s security components trust. This means anyone that installed this normally legitimate piece of software would get infected without further warning. This level of compromise suggests that fairly sophisticated threat attackers were behind the KeRanger campaign. KeRanger is a port of a Linux-based ransomware variant called Linux.encoder. For the most part, ransomware has primarily affected Windows computers. However, one of my predictions for 2016 was that ransomware would go cross-platform, and affect a wider range of operating systems, including mobile ones like Android and iOS. Seeing these threat actors starting with an experimental Linux version, and modifying it to affect OS X seems to validate that prediction. How can YOU ward off crypto-ransomware attackers? Realize Macs aren’t immune to malware! – If you’re an Apple user, it’s time say goodbye to the thought that your Mac is invincible against malware. Macs were never invulnerable to attacks or security problems, despite Apple’s cute marketing campaigns and fan-boys’ claims. Rather, Macs have enjoyed the benefit of security by obscurity. Believe it or not, cyber criminals are money-motivated and look for good returns on their investments. Trying to figure out how to create malware for a less familiar operating system is hard. However, since Macs have become popular, we are now seeing many signs that criminals are starting to target them. Your Mac needs anti-virus too. Don’t be lazy; backup – I know you’re more interested in blocking ransomware altogether, but in security, there is no one perfect solution. Really, the best way to totally mitigate ransomware threats is to ensure that they won’t really affect you even if you are infected. If you back up your files regularly, you can always recover them and move on – even if some shady criminal encrypts them. If anything, ransomware has proved how few people and organizations actually backup their critical data. Give yourself a little cyber insurance by always backing up. Be careful what you click – Most ransomware is delivered through malicious emails that contain shady attachments or web links. Really, you should avoid interacting with unsolicited content in emails, and be careful what you click when browsing the web. Also, I recommend that you only download and install software from trusted sources. For instance, OS X user can now limit their Mac from installing software from anywhere but the Apple store. While sophisticated attackers have occasionally slipped bad software into the store, it’s extremely rare. Use endpoint protection – If you use your laptop or computer outside of your home or office, you need endpoint security suites to protect it. These suites include a Firewall, antimalware software, and other layers of security controls that prevent the most obvious of threats from infecting you. Again, refer to point #1. Even if you are a Mac user, you should be using endpoint security software today. Consider advanced threat protection – If you manage a business network, you may already have many layers of network defense already, which is good. However, consider adding an advanced threat protection (ATP) solution to your arsenal. 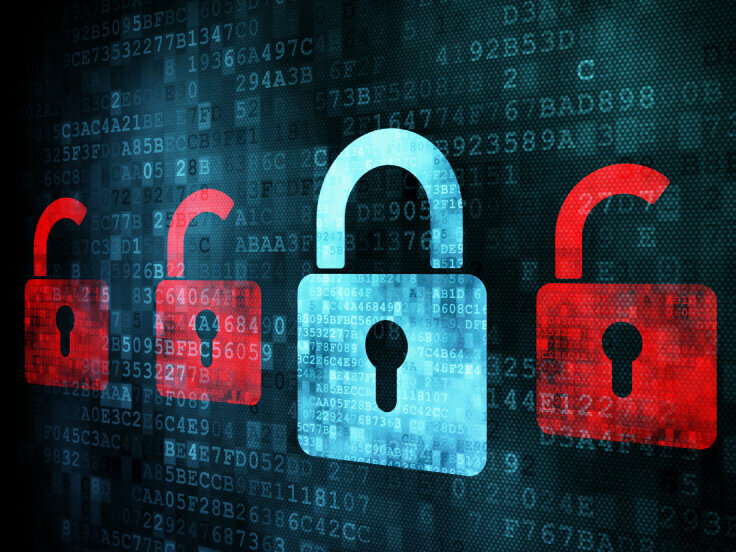 Legacy antivirus or antimalware solutions rely heavily on signatures to catch new threats. On the other hand, ATP solutions proactively monitor behavior to identify new malware that hasn’t been seen before. Ransomware authors are constantly tweaking their malware to get past signature solutions, literally on a daily or even hourly basis. You need more advanced malware detection solutions to catch the latest threats. DON’T PAY THE RANSOM! – I realize that as I give this advice, not everyone will follow it. When it comes down to it, if you’re a hospital that needs to quickly access a critical patient care file, or you’re a new parent with thousands of videos and pictures in one place, suddenly losing access to these files is unacceptable. It’s a complicated problem, and everyone will make their own decision about just how far they’ll go to regain access. That said, there are two very big problems with paying the ransom. First, these are criminals! There is no guarantee the attacker will recover your data. Second, and much more importantly, paying this ransom encourages the attacker’s behavior. Paying the ransom proves that this is a lucrative cyber crime strategy, which is why ransomware attacks have increased so much in the past few years. Recently, an FBI agent said that in some cases they have to recommend victims pay ransoms if they really need their files back. I, however, think this is horrible advice, and if we keep paying, we should expect to keep getting targeted. Ransomware is evil because it’s a threat that targets all equally. Everyone from the average consumer to grandmothers, to banks, to clinics, to critical infrastructure organizations have important digital data that they value or rely on to do business. Ransomware is effective because it targets that data directly. If you take anything from this blog, realize that ransomware is likely going to be the biggest cyber threat in 2016 and that if can affect you no matter what type of computer of mobile device you use. Protect yourself from becoming a ransomware target by keeping the above tips in mind. Take the defense of your important files into your own hands. PROTECT YOURSELF AGAINST PHISHING SCAMS! Phishing scams are among the most common forms of cybercrime. Although phishing is widespread, it is beatable. Apart from ensuring you install security software, the best way to combat scams is to learn what phishing looks like. Phishing is a kind of identity theft which is growing in popularity. By using fraudulent websites and false emails, perpetrators attempt to steal your personal data – most commonly passwords and credit card information. Criminals gain this information by sending you links to sites that look like sites you trust, such as your online banking provider or social networks, and are able to steal your data as you enter it. Some of the sites spoofed most regularly include PayPal, eBay, Yahoo! and MSN, as well as financial institutions – so don’t think that an email is guaranteed to be safe when it’s not from a bank. Be wary of emails asking for confidential information – especially information of a financial nature. Legitimate organisations will never request sensitive information via email, and most banks in the UK will tell you that they won’t ask for your information unless you’re the one contacting them. Don’t get pressured into providing sensitive information. Phishers like to use scare tactics, and may threaten to disable an account or delay services until you update certain information. Be sure to contact the merchant directly to confirm the authenticity of their request. Watch out for generic-looking requests for information. Fraudulent emails are often not personalized, while authentic emails from your bank often reference an account you have with them. Many phishing emails begin with “Dear Sir/Madam”, and some come from a bank with which you don’t even have an account. 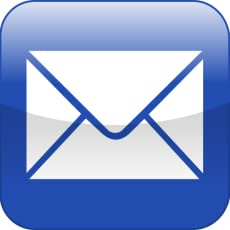 Never submit confidential information via forms embedded within email messages. Senders are often able to track all information entered. Never use links in an email to connect to a website unless you are absolutely sure they are authentic. Instead, open a new browser window and type the URL directly into the address bar. Often a phishing website will look identical to the original – look at the address bar to make sure that this is the case. Make sure you maintain effective software to combat phishing. Norton™ Internet Security automatically detects and blocks fake websites. It also authenticates major banking and shopping sites. Criminals love to to prey on people based on current news topics and there are few topics right now that are bigger than the 2016 United States presidential election. This can be seen in a new malware “CIA Election AntiCheat Control – 2016”. This computer infection pretends to be a notice from the CIA that requires people to send $50 or their upcoming vote will not count. When the infection starts it will search for the following processes and close them so that a victim cannot use them to learn how to remove the infection. If a user falls for this scam and sends a PaySafeCard code, the malware send a hardware ID, derived from the computer’s Processor ID, and the PaySafeCard code to the email address emilyrosefelt0@gmail.com. This can be seen in the source code below. After sending a payment, the CIA Election AntiCheat Control malware connect to the http://textupload.com/d54g3 webpage and download the contents of the page. If the page contains the victim’s hardware ID , the program will display a thank you message and uninstall itself. Though I would hope that everyone would see this as nothing but a scam, history has shown that people actually do believe these types of messages and send payments. If you run into a strange screen on computer called CIA Election Control, please be aware this is a scam and should be ignored. Attention business and home users, this is an urgent warning that the email virus SoBig.F could causes further mayhem by instructing infected computers to automatically download malicious programs. Any infected computers that are left on have the potential to become zombies, doing whatever the virus writer wants. The worm, which has spread to thousands of computers this week, has been programmed to turn PCs into “zombies”, directing them to a server controlled by the virus writer from which a so-called “Trojan horse” could be downloaded. If the writer of SoBig.F succeeds in installing a Trojan on infected PCs, users could be in for a nasty shock when they return to their computers. At the moment, it is not known what the downloaded material will do, but possibilities include launching another virus or spam attack, collecting sensitive information, or deleting files stored on an infected computer or network. The main effect of SoBig.F to date has been to slow down the internet with the sheer quantity of emails it has generated. What the worm downloads could display an offensive but largely harmless message or launch a malicious attack. Do what you can to protect your computer from this vicious attack! Ensure your anti-virus is up-to-date, run your anti-virus to check for infection, disinfect if necessary and ensure your computer’s firewall is properly configured. Originally Alameda Typewriter, ABM COMPUTERS has served the entire San Francisco Bay Area with professional, first-rate IT support and computer sales from the same location since 1939. Building on decades of experience, along with a dedicated team, we continue to provide in-shop and on-site standout, services and comprehensive, affordable solutions for all your computing needs. Alameda Business Machines provides professional service for home and business users. We offer installation, training, and guidance on equipment purchased elsewhere. We deliver solutions in a timely manner with on going technical assistance. Problems with your hard drive? 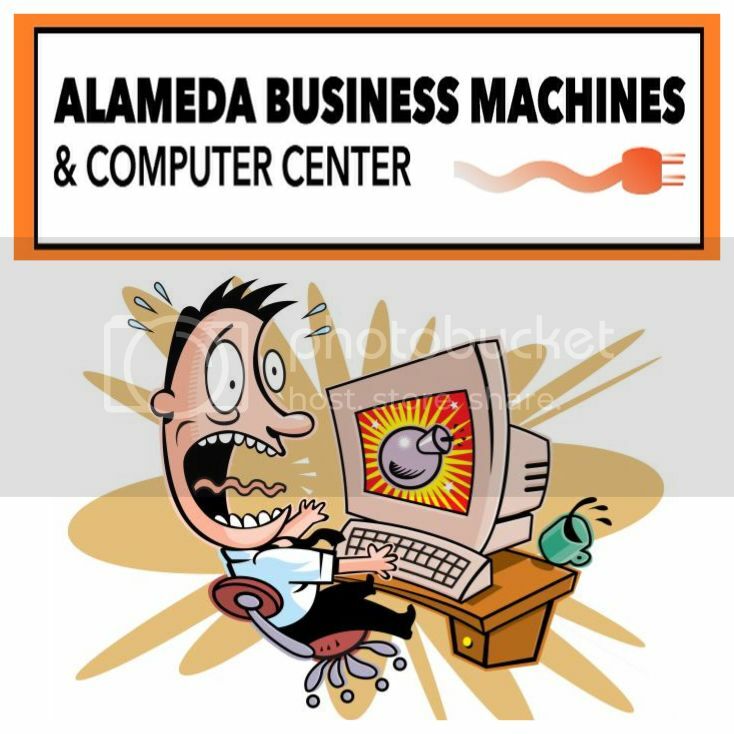 Alameda Business Machines will be more than happy to repair, replace, or even destroy any hard drive you need us to. We are here to service you and your machines! Looking for a new computer? Here at Alameda Business Machines, we not only repair, but we build as well! We can provide excellent service while creating your very own custom built machine. We also sell new computers, laptops, and more! In need of data transfer or backup solutions? We can find solutions for preventive backup solutions. ABM can also recover and transfer your existing files to a safe backup or to a new computer. Be prepared!